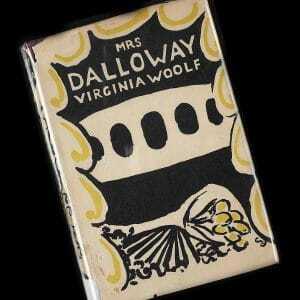 Virginia Woolf loved London, and her novel Mrs Dalloway famously begins with Clarissa Dalloway walking through the city. David Bradshaw investigates how the excitement, beauty and inequalities of London influenced Woolf’s writing. If Cornwall captured Woolf’s soul, London bagged her heart. Writing to a cousin from Hampshire on 18 August 1898, she confessed that she was ‘counting the weeks till the 22nd September when we return to our beloved city’. Her love affair with London, and especially the City of London, would never cool, and when parts of it were reduced to rubble during the Blitz of 1940–41 she lamented its devastation like a grief-stricken widow. 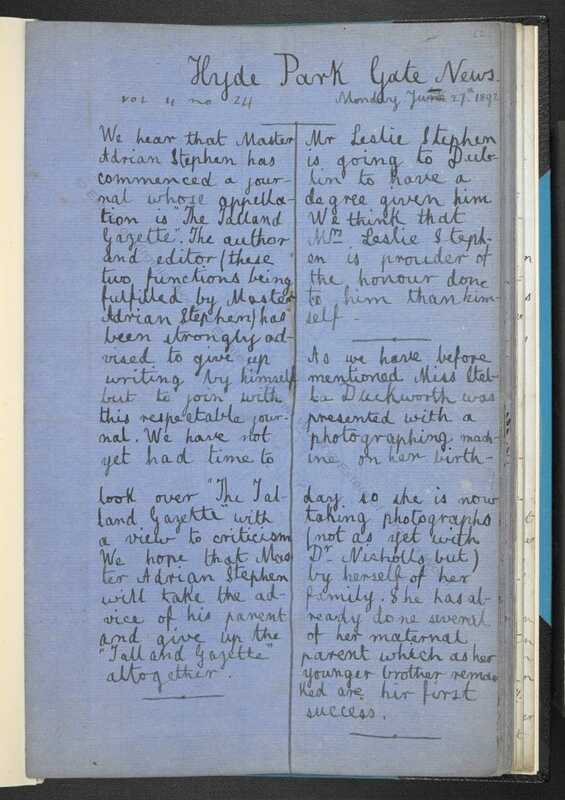 Virginia Woolf’s connection to London is evident in this travel notebook that she kept in her twenties. She writes of her ‘longing’ for the city and the beauty of ‘a wet London street, with lamplight twisted on the pavement’. 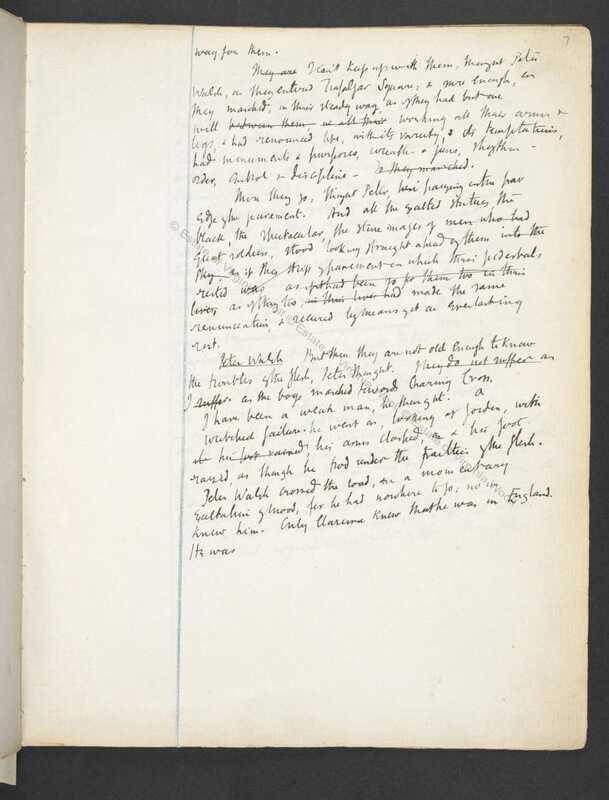 Title：Virginia Woolf: travel and literary notebook; 1906-1909 Author/Creator：Virginia Woolf Held by：British Library Shelfmark：Add MS 61837 Copyright：© The Society of Authors as the Literary Representative of the Estate of Virginia Woolf. You may not use the material for commercial purposes. Please credit the copyright holder when reusing this work. 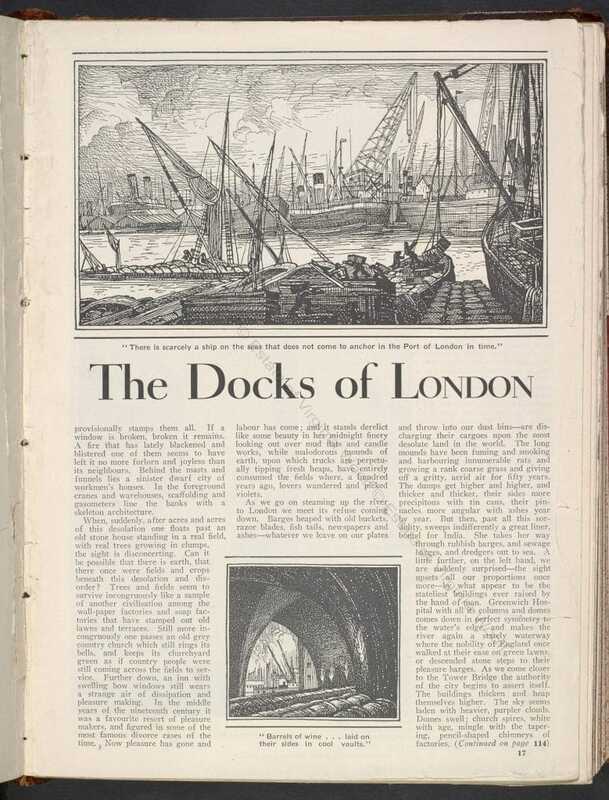 Virginia Woolf’s vivid sketch of the London Docks and River Thames from the London Scene essays, 1931. 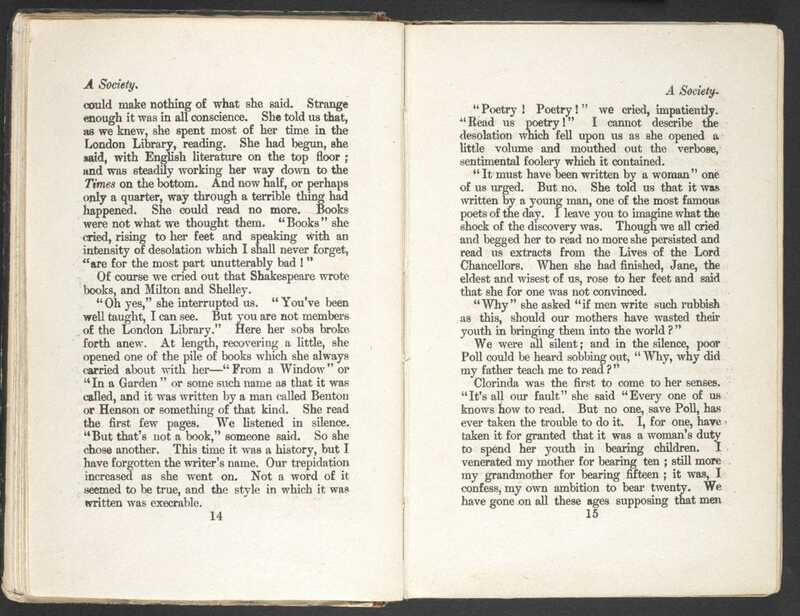 Title：'The London Scene' essays by Virginia Woolf, from Good Housekeeping magazine Author/Creator：Virginia Woolf Held by：British Library Shelfmark：P.P.1524.dac. Copyright：Virginia Woolf: © The Society of Authors as the Literary Representative of the Estate of Virginia Woolf. In this letter written on 29 December 1929 Virginia Woolf comments upon the ‘chaos of London’ at Christmas time. 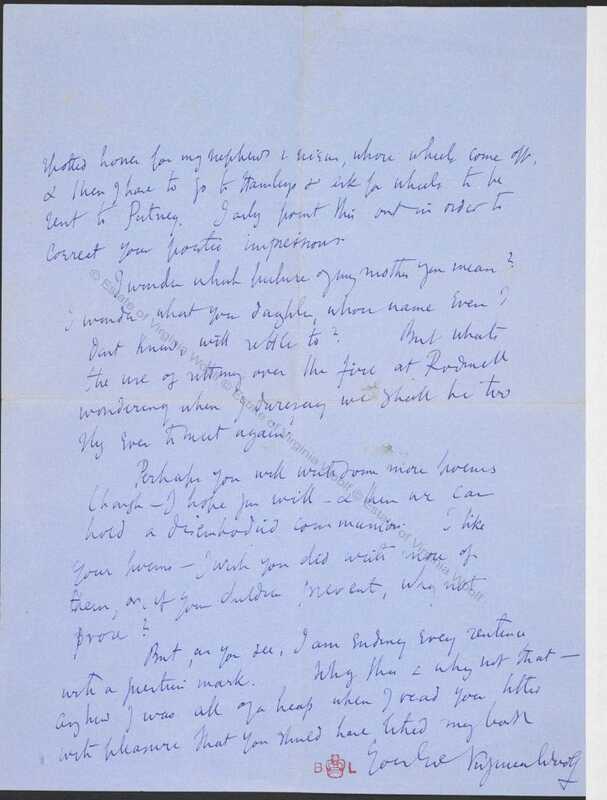 Title：Letter from Virginia Woolf to Frances Cornford about A Room of One's Own, 1929 - Darwin and Cornford Papers. Vol. 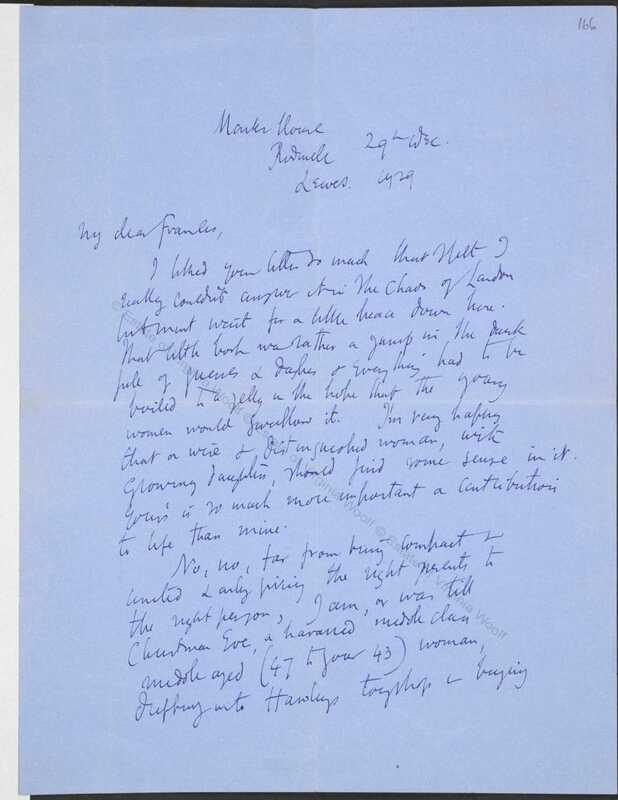 L. Correspondence with Frances Cornford: 1913-1955, n.d. Author/Creator：Virginia Woolf Held by：British library Shelfmark：Add MS 58422 Copyright：© The Society of Authors as the Literary Representative of the Estate of Virginia Woolf. You may not use the material for commercial purposes. Please credit the copyright holder when reusing this work. people busy about their activities, hands putting stone to stone, minds eternally occupied not with trivial chatterings … but with thoughts of ships, of business, of law, of administration and with it all so stately (she was in the Temple), gay (there was the river), pious (there was the Church) (p. 116). She walks up Fleet Street towards St Paul’s noting the ‘queer alleys, tempting by-streets’ on either side of her, and conscious of her daring as ‘a pioneer, a stray, venturing, trusting’ (p. 117) beyond her normal environment. Nearer to St Paul’s she becomes even more intensely aware that she is being transported by ‘the geniality, sisterhood, motherhood, brotherhood of this uproar’ (p. 117), before a restraining sense of duty kicks in and she returns to Westminster to prepare for her mother’s party. During the Second World War, a distraught Woolf walked through the same bombed district. 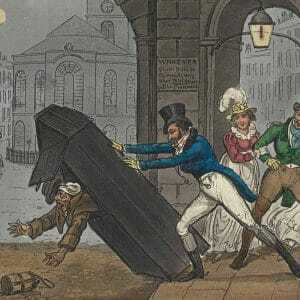 ‘And then, the passion of my life, that is the City of London – to see London all blasted, that too raked my heart. Have you that feeling for certain alleys and little courts, between Chancery Lane and the City?’ she asked her friend Ethel Smyth. ‘I walked to the Tower the other day by way of caressing my love of all that’. 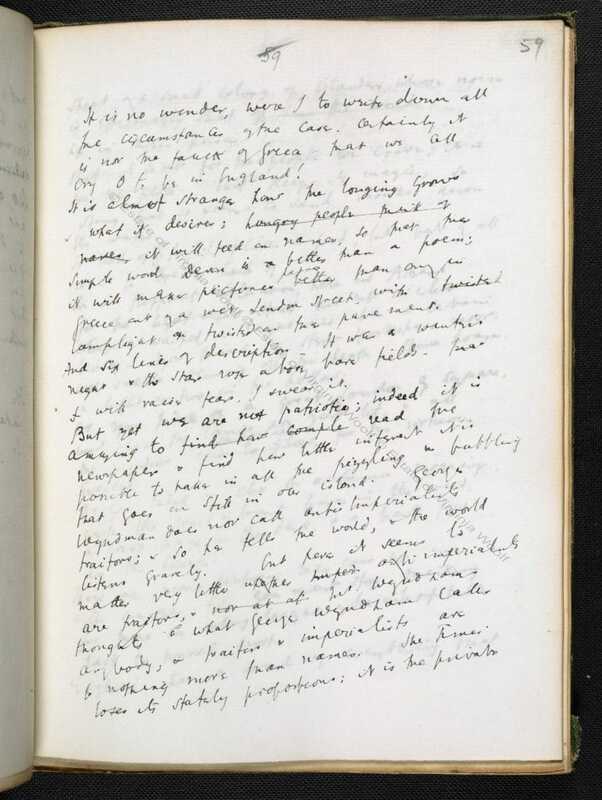 Written in 1923-24, this manuscript draft of Mrs Dalloway opens the novel in Westminster. 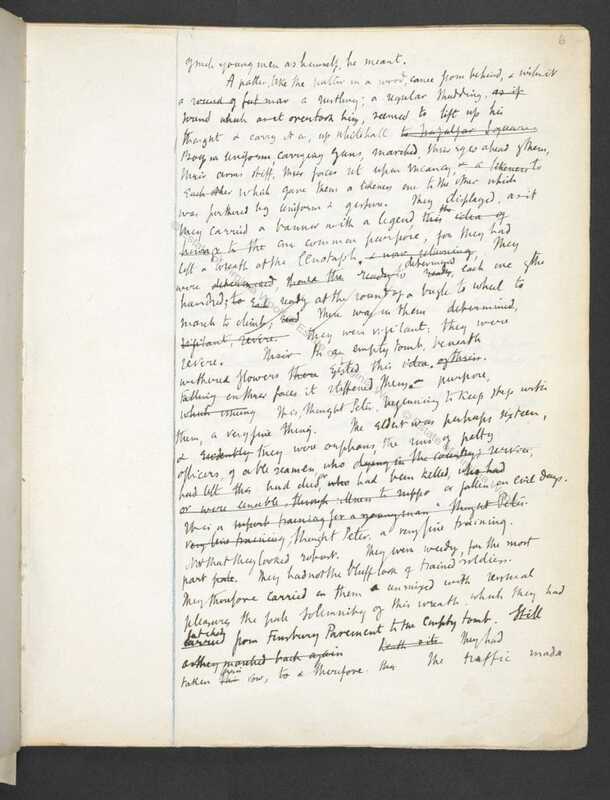 Title：Notebook drafts of Virginia Woolf's Mrs Dalloway (Volume II) Author/Creator：Virginia Woolf Held by：British Library Shelfmark：Add MS 51044 Copyright：© The Society of Authors as the Literary Representative of the Estate of Virginia Woolf. You may not use the material for commercial purposes. Please credit the copyright holder when reusing this work. 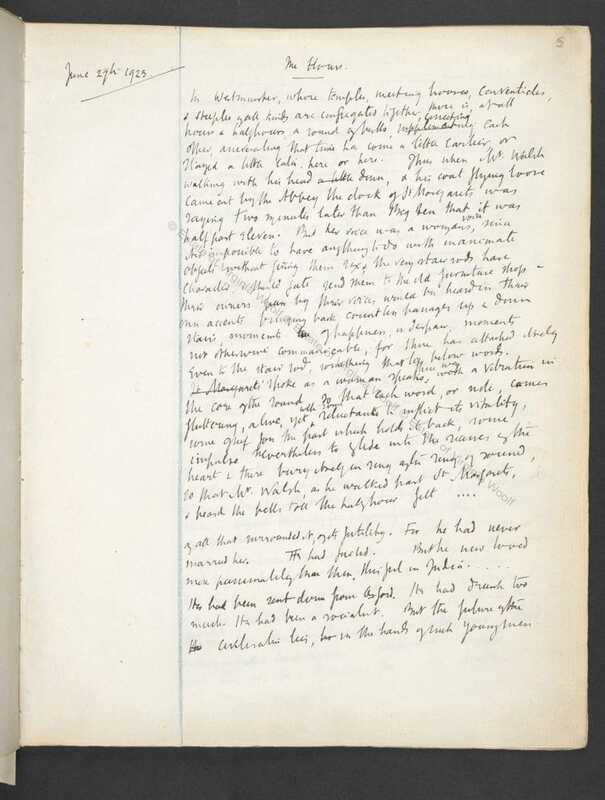 Written in 1923–24, this manuscript draft of Mrs Dalloway opens the novel in Westminster. Title：Notebooks of Virginia Woolf for her novel Mrs Dalloway, 1925, and for essays published in The Common Reader, 1925 Author/Creator：Virginia Woolf Held by：British Library Shelfmark：Add MS 51044 Copyright：© The Society of Authors as the Literary Representative of the Estate of Virginia Woolf. You may not use the material for commercial purposes. Please credit the copyright holder when reusing this work. the swing, tramp, and trudge; in the bellow and the uproar; the carriages, motor cars, omnibuses, vans, sandwich men shuffling and swinging; brass bands, barrel organs; in the triumph and the jingle and the strange high singing of some aeroplane overhead was what she loved; life; London; this moment of June (p. 4). Significantly, once she is in Bond Street she is ‘not even Clarissa any more’ but more formally and restrictively, ‘Mrs Richard Dalloway’ (p. 9). Your world then, the world of professional, public life … is enormously impressive. Within quite a small space are crowded together St Paul’s, the Bank of England, the Mansion House, the massive if funereal battlements of the Law Courts; and on the other side, Westminster Abbey and the Houses of Parliament. There, we say to ourselves … our fathers and brothers have spent their lives. Works such as Jacob’s Room, Flush and The Years in particular engage with the ideological fabric of these monumental buildings, as well as exposing London’s social iniquities and glaring inequalities. Of all her longer works of fiction only To the Lighthouse and Between the Acts are not set in London, and in every one of her other novels we either visit or glimpse some of the more impoverished quarters of the city and witness its homeless, its prostitutes, its tawdriness, its sordidness and its glaring disparities of wealth. Likewise, as Peter Walsh walks up Tottenham Court Road in Mrs Dalloway (1925) he thinks that a speeding ambulance is ‘One of the triumphs of civilization’ (p. 128), painfully unaware that it is almost certainly hurrying towards the impaled corpse of Septimus Warren Smith, a victim of medical backwardness. In short, Woolf’s London is alive with contradictions, and she emphasises this from the very beginning of her career when she describes both the imperial splendour of the Victoria Embankment and the shameful hordes of the destitute it accommodated each night in the opening pages of her first novel, The Voyage Out (1915). In the 1921 short story, ‘A Society’, Virginia Woolf highlights prominent London buildings – such as the British Museum and law courts – as embodiments of patriarchal oppression. Following the death of their father in 1904, Woolf, her sister Vanessa and her two brothers, Adrian and Thoby, moved from 22 Hyde Park Gate, their family home in Kensington, to the racier environs of 46 Gordon Square, Bloomsbury, and here the green oases of that neighbourhood’s squares – Brunswick, Fitzroy, Tavistock and Gordon – stimulated her imagination and offered daily respite from London’s more pervasive brick, stone, tarmac, concrete and noise. 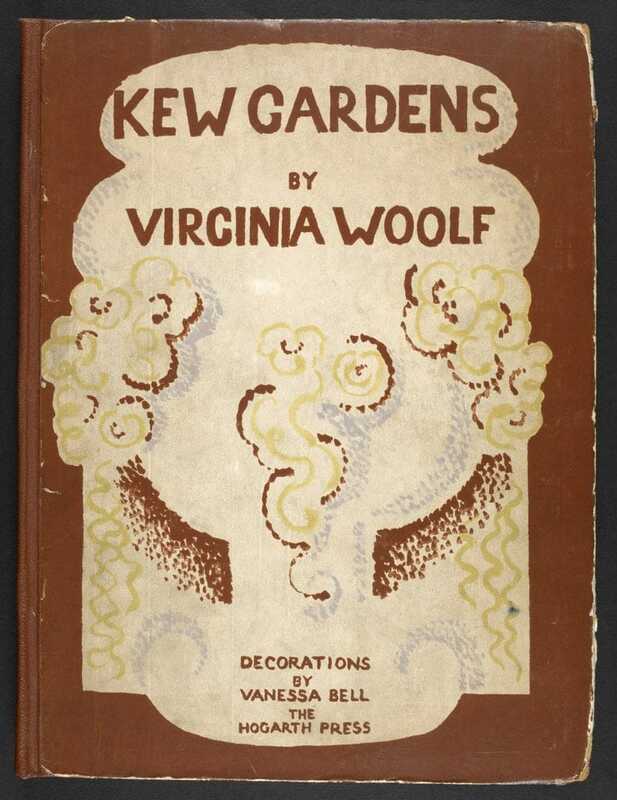 The second edition of Kew Gardens by Virginia Woolf, with illustrations by Vanessa Bell. The short story is set in a flowerbed within the famous west London gardens. 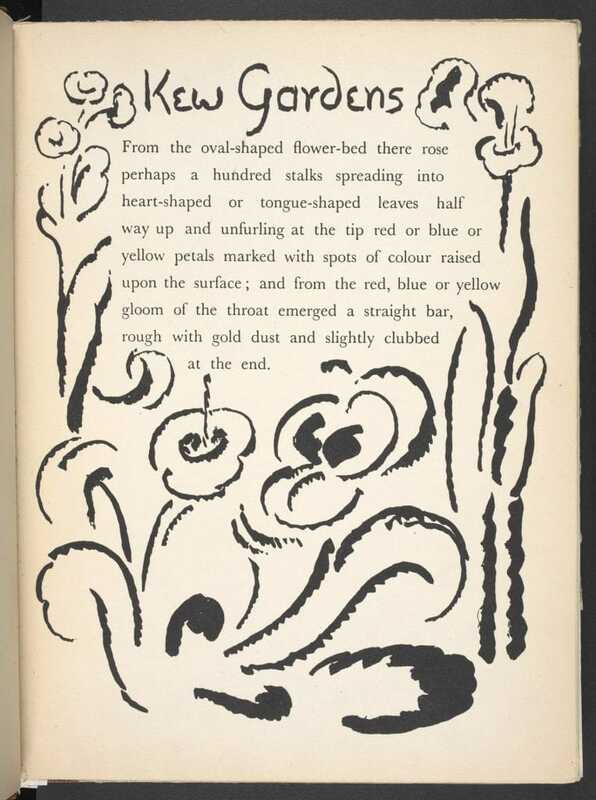 Title：Kew Gardens Author/Creator：Virginia Woolf, Vanessa Bell Held by：British Library Shelfmark：12604.h.34. Copyright：Virginia Woolf: This material is in the Public Domain. 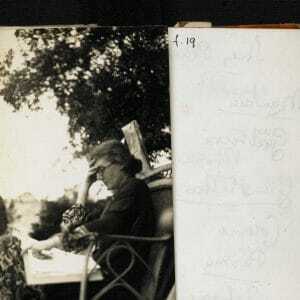 Vanessa Bell: © Estate of Vanessa Bell, courtesy of Henrietta Garnett. Except as otherwise permitted by your national copyright laws this material may not be copied or distributed further. 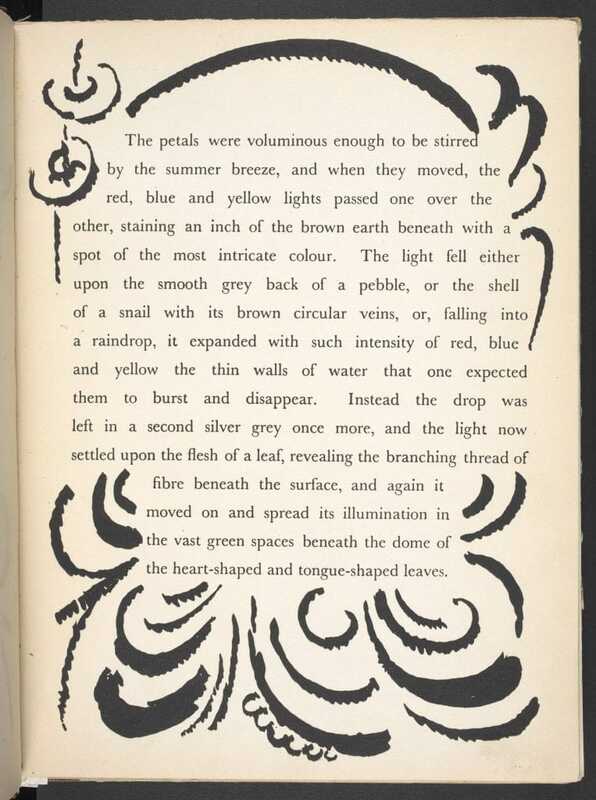 Title：Kew Gardens Author/Creator：Virginia Woolf Held by：British Library Shelfmark：12604.h.34. Copyright：Virginia Woolf: This material is in the Public Domain. Vanessa Bell: © Estate of Vanessa Bell, courtesy of Henrietta Garnett. Except as otherwise permitted by your national copyright laws this material may not be copied or distributed further. The Hyde Park Gate News, the family newspaper kept by Virginia Woolf and Vanessa Bell in the 1890s when they were children, includes many references to walks around Kensington Gardens. Title：Hyde Park Gate News, a magazine by Virginia Woolf and Vanessa Bell Author/Creator：Virginia Woolf, Vanessa Bell and Julian Thoby Stephen Held by：British Library Shelfmark：Add MS 70725-70726 Copyright：Virginia Woolf: © The Society of Authors as the Literary Representative of the Estate of Virginia Woolf. You may not use the material for commercial purposes. Please credit the copyright holder when reusing this work. Vanessa Bell: © Estate of Vanessa Bell, courtesy of Henrietta Garnett. Except as otherwise permitted by your national copyright laws this material may not be copied or distributed further. ‘Oxford Street Tide’ by Virginia Woolf from the London Scene essays, 1932. 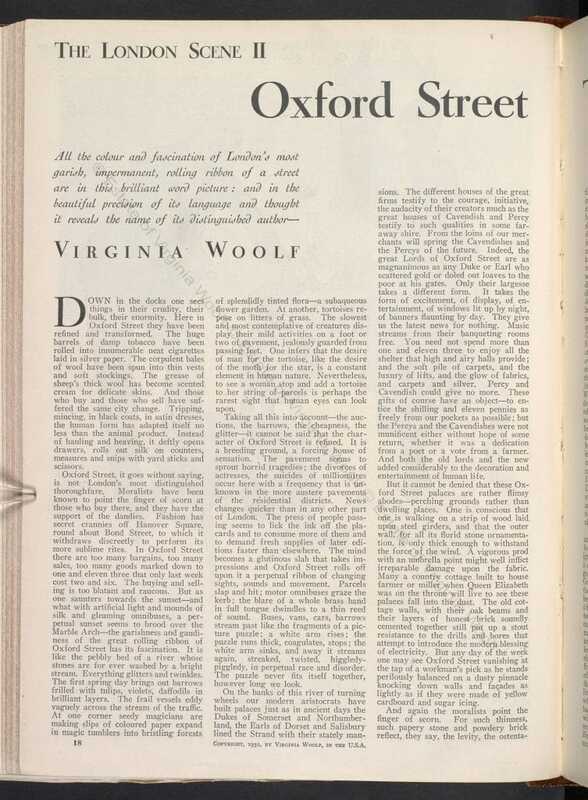 Title：'The London Scene' essays by Virginia Woolf, from 'Good Housekeeping' magazine Author/Creator：Virginia Woolf Held by：British Library Shelfmark：P.P.1524.dac. Copyright：Virginia Woolf: © The Society of Authors as the Literary Representative of the Estate of Virginia Woolf. Virginia Woolf’s account of walking through London in the essay ‘Street Haunting’, 1930. Title：'Street Haunting', 1930 Author/Creator：Virginia Woolf Held by：British Library Shelfmark：Cup.510.pb.30. Copyright：© The Society of Authors as the Literary Representative of the Estate of Virginia Woolf. You may not use the material for commercial purposes. Please credit the copyright holder when reusing this work. The Flight of the Mind: The Letters of Virginia Woolf, Vol. I, 1888–1912, ed. by Nigel Nicolson assisted by Joanne Trautmann (London: Hogarth Press, 1983), p.19. ‘London Revisited’, in The Essays of Virginia Woolf, Vol. II, 1912–1918, ed. by Andrew McNeillie (London: Hogarth Press, 1987), pp. 50–52 (p. 50). The Diary of Virginia Woolf, Vol. V, 1936–1941, ed. by Anne Olivier Bell assisted by Andrew McNeillie (London: Hogarth Press, 1984), p. 276. Virginia Woolf, Mrs Dalloway, ed. by David Bradshaw (Oxford: Oxford World’s Classics, 2000), p. 116. Leave the Letters Till We’re Dead: The Letters of Virginia Woolf, Vol. VI, 1936–1941, ed. by Nigel Nicolson assisted by Joanne Trautmann (London: Hogarth Press, 1980), p. 431. David Bradshaw, ‘Woolf’s London, London’s Woolf’, in Virginia Woolf in Context, ed. by Bryony Randall and Jane Goldman (Cambridge: Cambridge University Press, 2012), pp. 229–42 (p. 237). The Diary of Virginia Woolf, Vol. II, 1920–1924, ed. by Anne Olivier Bell assisted by Andrew McNeillie (London: Hogarth Press, 1978), p. 301. Virginia Woolf, A Room of One’s Own and Three Guineas, ed. by Morag Shiach (Oxford: Oxford World’s Classics, 1992), p. 176. See David Bradshaw, ‘“Great Avenues of Civilization”: The Victoria Embankment and Piccadilly Circus Underground Station in the Novels of Virginia Woolf and Chelsea Embankment in Howards End’, in Transits: The Nomadic Geographies of Anglo-American Modernism, ed. by Giovanni Cianci, Caroline Patey and Sara Sullam (Oxford and Bern: Peter Lang, 2010), pp. 189–208. Virginia Woolf, ‘Sketch of the Past’, in Moments of Being, ed. by Jeanne Schulkind, rev. by Hermione Lee (London: Pimlico, 2002), pp.78–160 (p. 89). The Diary of Virginia Woolf, Vol. IV, 1931–1935, ed. by Anne Olivier Bell assisted by Andrew McNeillie (London: Hogarth Press, 1982), p. 319. Virginia Woolf, Selected Essays, ed. by David Bradshaw (Oxford: Oxford World’s Classics, 2008), pp.199–203 (p. 199). Virginia Woolf, Selected Essays, pp. 177–87 (p. 177). David Bradshaw (1955–2016) was Professor of English Literature at Oxford University and a Fellow of Worcester College. 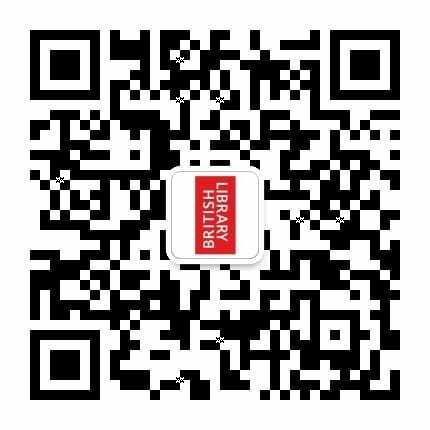 Specialising in late 19th and early 20th century literature, he published on Virginia Woolf, James Joyce, T S Eliot, E M Forster, Aldous Huxley, and Evelyn Waugh, with a particular interest in areas including censorship and obscenity, political and social movements, and the city. Among other modernist texts he has edited Virginia Woolf’s Mrs Dalloway, To the Lighthouse and The Waves, co-edited Prudes on the Prowl: Fiction and Obscenity in England, 1850 to the Present Day, and was Co-Investigator of the Complete Works of Evelyn Waugh project at University of Leicester. Mrs Dalloway, which takes place on one day in June 1923, shows how the First World War continued to affect those who had lived through it, five years after it ended. David Bradshaw explores the novel's commemoration of the dead and evocations of trauma and mourning. 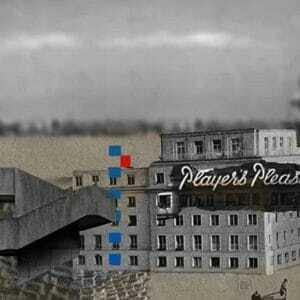 The alienated modernist self is a product of the big city rather than the countryside or small town. Katherine Mullin describes how an interest in the sensibility associated with the city – often London, but for James Joyce, Dublin – developed from the mid-19th century to the modernist period. Narratives of Virginia Woolf’s life often place great emphasis on her depression and suicide. Lyndall Gordon considers the way this has overshadowed Woolf’s legacy, and clouded her reputation as a seminal novelist, feminist, and politicized intellectual. The Gentle Author explores Pierce Egan’s 19th-century bestseller, Life in London, in which Tom and Jerry's 'rambles and Sprees through the Metropolis' offer readers a unique glimpse into both high and low urban culture. 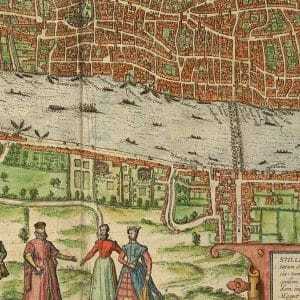 Early modern London was an expanding metropolis filled with diverse life, from courtiers, merchants and artisans to prostitutes, beggars and cutpurses. Here Professor Eric Rasmussen and Ian DeJong describe the city that shaped Shakespeare's imagination. Victorian businessman Charles Booth set out to see if poverty levels were exaggerated - and found they were worse. 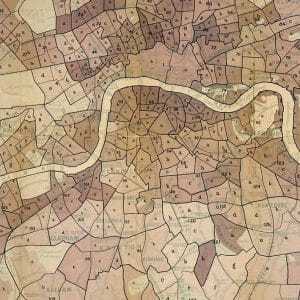 His map shows the patchwork nature of the capital: poor and rich live side by side, much like today. Booth's work helped establish the old age pension, first paid on 1 Jan 1909.